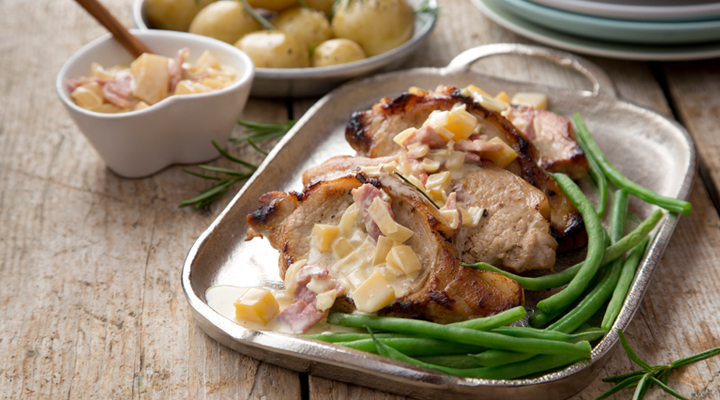 These savoury pork chops are quick and can be served as a great mid-week meal. 1. Season the pork chops with a pinch of salt and pepper. Melt half of the butter in a frying pan set over a medium­–high heat. Sauté the pork chops for about 5 minutes per side, then transfer to a plate. 2. Reduce the heat to medium–low and add the remaining butter to the pan. Add the diced rashers, onion and garlic and cook, stirring, for about 3 minutes, until the onion has softened. 3. Add the white wine and let it bubble up, then pour in the cream and mango and bring to the boil, stirring and scraping up any bits stuck to the bottom of the pan. Simmer gently for about 3 minutes, until the sauce has slightly reduced. Return the pork to the pan with any accumulated juices and turn to coat the chops in the sauce. Simmer for about 2 minutes to reheat them. 4. Serve the pork chops on warm plates with the sauce drizzled over and some boiled baby potatoes and steamed green beans on the side. TIP: You could add a little curry powder when you add the onion and garlic and finish the dish with a dollop of yogurt.